Villa Cennet Bahcesi (which means Paradise Garden) is located in the heart of the pretty village of Üzümlü, in an elevated position, with glorious panoramic views. 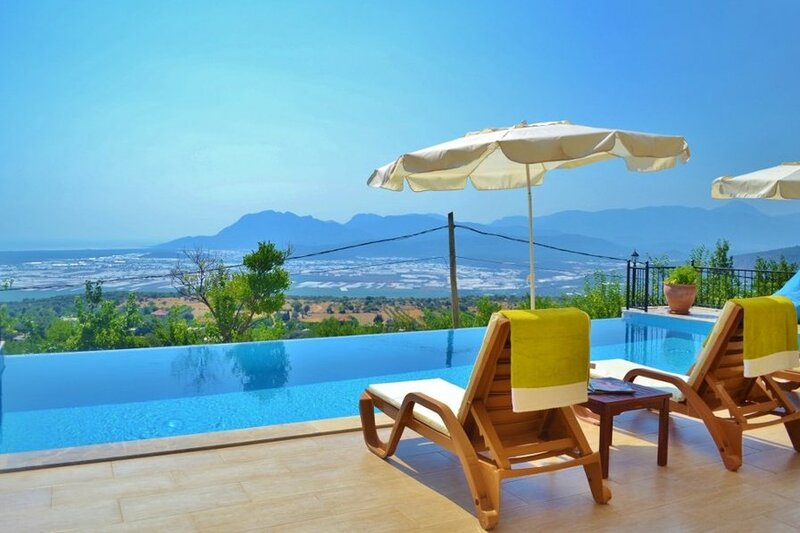 From the spacious terrace on the top floor, you can see all the way to the sea at Patara, plus you also have the dramatic background of the Taurus mountains. It was its situation, with spectacular views over to Patara and the fact it was right on the Lycian way. Ramazan had been brought up in a village and was familiar with the way of life. We loved it because you have the best of both worlds, peace and quiet in the countryside and yet only a short drive down to the holiday resort of Kalkan, where we first met. We both think it is a great place for a holiday because it is a quiet area in a beautiful setting, with gardens and friendly people, taking in the Turkish way of life. It has much to offer in the way of historical sites to visit, is a great walking area and has a variety of activities such as visiting Saklikent Gorge, boat trips, horse riding and jeep safaris to name but a few, all of which can be organised for you, and guests picked up locally.